Realm of Writing Korean Celt: Two months. How can I wait two months? That's what my daughter has been asking about every ten seconds since Saturday. Why, do you ask? 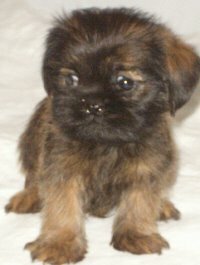 We put down a deposit on a puppy this past Saturday, but can't bring the puppy home for another ten weeks. That's why she keeps bemoaning the two months she must wait before she can start loving and playing with her new pet. 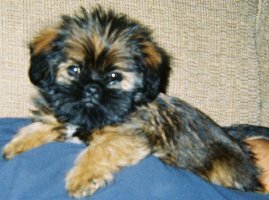 We didn't go with the brussels griffon, in the end, but chose a shiffon which is a mix between an griffon and shih tzu. Here are a couple of pictures to give you an idea of what they look like. We bought a dog collar yesterday in anticipation and my daughter has it safely tucked away in a special treasure box. Kids kill me. Now I'm going to tell you about my momentary contact lens tragedy of yesterday. Somehow, while I was putting in my contacts yesterday morning before chuch, I failed to notice that my right lens didn't actually make it onto my eye. I put my left lens in when I noticed my right eye wasn't clear, so I tried adjusting my contact to make sure it was properly positioned on my eye. Imagine my surprise when I felt just my eyeball and no contact. That in and of itself wouldn't be so bad if I hadn't been simultaneously running the faucet at the time I tried to adjust my contact. I immediately realized I'd just probably washed my right contact lens down the drain. I got down on my hands and knee (because I still can't kneel on my injured knee) and couldn't find a thing. So, I was bummed. I was bummed because I was going to have to make an appointment to see the eye doctor and get new lenses and go through that entire hassle. However, thankfully, this morning when I woke up I remembered that I had an extra right contact lens in my medicine cabinet because it was left over from when I was testing fit on my contacts. So, I am now able to see sans glasses again. I am happy, and all is right with the world again.